As the wife of ATS President David Gozal, MD, MBA, Leila Kheirandish-Gozal, MD, MSc, is sort of like the ATS’s First Lady. She shares in her husband’s involvement with the Society, which she has considered a second home, since joining in 2009. A researcher at heart, Dr. Kheirandish-Gozal is driven by a deep need and curiosity to solve complex mysteries. She is a translational sleep researcher with a focus on children. Her major aims are to better understand the consequences of sleep apnea and improve diagnostic methodologies and personalized treatments. It is estimated that 1-3 percent of all children worldwide are affected by the condition. 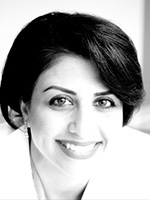 Dr. Kheirandish-Gozal’s career began over a decade ago as a bench-based investigator. While a clinically trained physician, she was eager to gain an in-depth knowledge about the mechanisms of disease. For several years she conducted animal experiments in mice. Yet beyond scientific findings, this research taught her the values of patience, perseverance, and humility—some of her greatest takeaways included how to confront setbacks and failure. “Basic science is not for the fainthearted!” she says. Early work soon revealed her true passion, at the intersection of laboratory knowledge and clinical observation. Things in clinic that defied explanation fascinated her, and she excelled at articulating a research plan to find the answers, while engaging scientists and clinicians in the process. Dr. Kheirandish-Gozal is passionate about helping in children in underdeveloped countries and feels caring for those most in need makes all her efforts worthwhile. Eventually, she hopes to apply findings in sleep-disordered breathing in children and develop a simple, user-friendly test that parents can use at home. In 2015, she secured a U.S. patent for diagnostic tools that health care providers can use for obstructive sleep apnea. She is hopeful that the field will continue inching away from a “one size fits all” mentality and more towards precision medicine. On top of her busy research schedule and extracurricular activities (she is an active volunteer with several ATS Assemblies and serves on the board of various organizations), Dr. Kheirandish-Gozal treats teaching and mentorship as a priority. “Seeing trainees leave our program to a bigger and more exciting future is like being a mother bird watching its babies spread their wings and fly,” she says. Her own intrigue with medicine dates back to her father’s career as an infectious disease specialist. She grew up playing doctor-patient games, mending playmates’ bumps, bruises, and scratches, and later regularly accompanying her father at his clinics and lectures. Dr. Kheirandish-Gozal’s commitments to medicine, as well as family, make her a role model for work-life balance. She enjoys being active with her husband and sons, gardening, taking photographs, and watching movies.